Dock Butte has been on my list of hikes to get around to doing for quite some time so when I learned that the snow was lingering there, I grabbed my snowshoes hoping for a chance to use them. I also brought the ice trekkers, because the temperatures had dropped since that first snowfall and since snowshoes do better in fresh powder than on ice, there was a good possibility that the snow on Dock Butte would be crusted over and the ice trekkers would give safer footing on some of the snow-covered side slopes. Either way, I was prepared. Here we are, at the trailhead for Blue Lake. 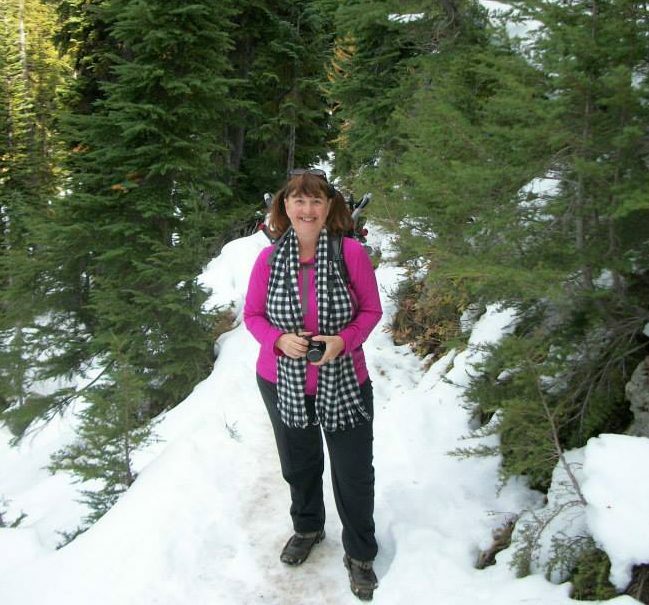 After less than a mile along the Blue Lake trail, I took a side trail that would take me to Dock Butte. Sometimes almost completely covered with stray roots, the trail to Dock Butte is a less traveled trail and not as well maintained as the more popular trails. It is a well enough worn track though and we managed to find our way without too much difficulty. If you are looking for more hikes in the Baker Lake area, I highly recommend putting this trail on your gotta-get-to list. 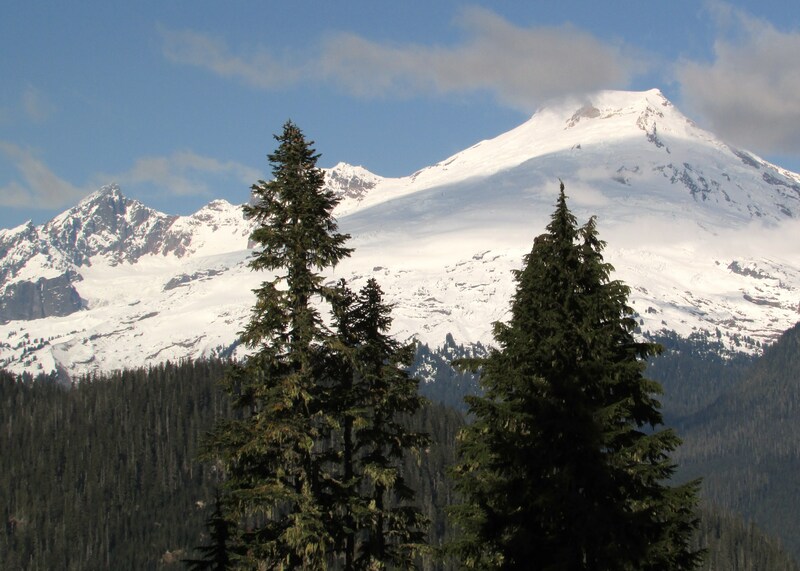 Just look at the wonderful view of Mount Baker from along the way. It wasn’t too long before we hit snow. It was frozen solid and at times even a bit difficult to push in the trekking pole into, so it didn’t look like we would get the opportunity to use our snowshoes on this hike after all. I was very glad that I had brought our ice trekkers though. The snow along this long sideslope was frozen solid and in places, the footpath through the snow might not have been wide enough for snowshoes. I stepped carefully and with the help of my poles, felt safe and secure during this crossing. Just one of many yarns passed. One of my favorite lunches when out hiking just happens to be leftover pizza. Having made a pizza covered in black bean, chicken breast, mushrooms, olives and cheese the evening before, these leftovers seemed even tastier than usual as U sat below Dock Butte to eat. Once the site of a fire lookout, I savored every tasty bite as I replenished the calories I had exhausted during the climb to get such a magnificaent view. With so many of favorite local peaks visible, it was such a lovely spot for lunch! 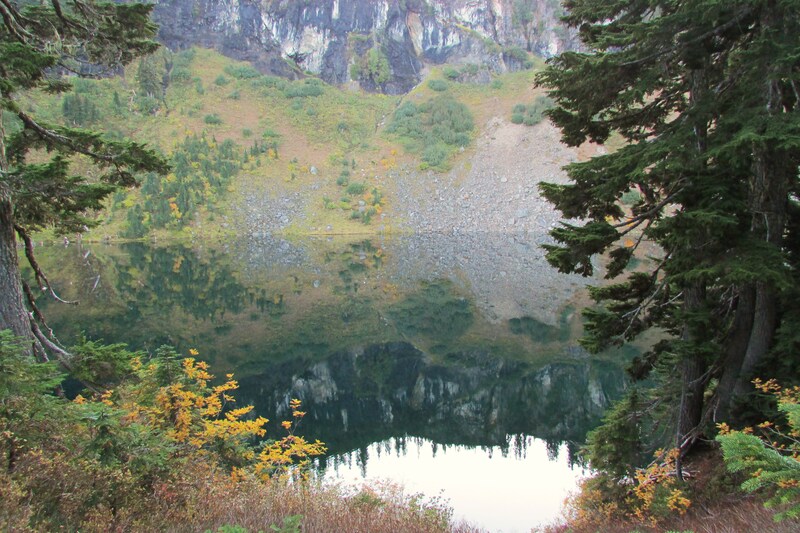 After the picnic, I hiked back down to re-join the trail to Blue Lake so I could check out the lake too. A very deep lake and said to have some good fishing. Driving directions with road and trail conditions and more information about the trail to Dock Butte and Blue Lake can be found on the Mount. Baker-Snoqualmie National Forest website. Go here – http://www.fs.usda.gov/recarea/mbs/recarea/?recid=17610 – for that, and for recent trip reports on the Washington Trails Association website, go here – http://www.wta.org/go-hiking/hikes/dock-butte. The Dock Butte trail is rated as “more difficult”, most likely due to its lack of regular maintenance than length (only about 4 miles round trip) and elevation gain/loss (only 1,400′).